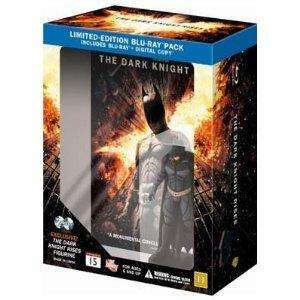 The Dark Knight Rises Limited Edition Figurine (Region 2 Blu-ray + Digital Copy). £18.79. Free delivery. Sold by Vida_Entertainment and Fulfilled by Amazon. On offer last month at £34.99. Not to everyones' taste of course. Does anyone have any more info about the actual figurine? Not necessarily? Bane is one of the figurines, too. Isn't Catwoman one of the possible figurines as well? There's also a Catwoman figurine version knocking around. Note that the people trying to flog this for silly amounts on Ebay... haven't been successful. No recent sales at anything other than face value or less. That'll go nicely with my Batcowl limited edition. Thank you. Does the blu ray come with all the special features? Why wouldn't it? Is there a featureless cheapo version? Do you think they'll let me keep the figurine, but replace the film with a better one? Do you think they'll let me keep the figurine, but replace the film with … Do you think they'll let me keep the figurine, but replace the film with a better one? Or you sell the blu-ray. I'm sure there are plenty that disagree with your thoughts on the film and would buy it.